In Honor of Fat Tuesday! 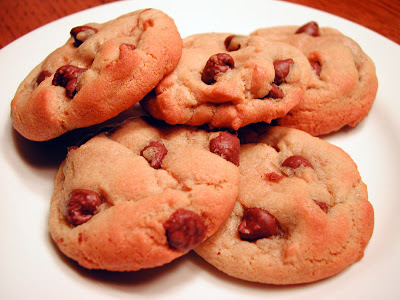 I had made these cookies once before and really liked them. This Christmas I decided to make a double batch so I could give them out as gifts. 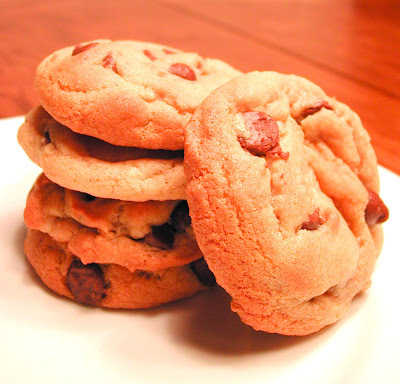 The recipe is quite large to begin with, so a double batch was a little hard to work with. I managed however. The only thing that I would change in this recipe is the addition of vanilla. I forgot to add it to mine and I did notice it missing. That's because I love vanilla and wouldn't normally make a cookie without. Beat together margarine, sugar, and oil until fluffy. Beat in eggs and molasses, then add flour and baking soda. Mix in milk chocolate chunks and nuts. Scoop cookie dough onto greased cookie sheet (I used parchment paper). Flatten each scoop of dough and bake. They bake the large cookies at 325 degrees in a convection oven for 20 minutes. For conventional ovens and a tablespoon of dough, cook at 350 degrees and start to check for doneness after 8 minutes. (I cooked my tablespoons of dough at 325 in a convection oven for 8 minutes). They were chewy in the center and crisp on the outside, just the way I like! These look perfect. I like to put lots of vanilla in baked goods, too. I'm going to be celebrating Fat Pants Wednesday, tomorrow, as well. As in the apple orchards Jaswell Farms? OMG, if it is, I'm getting wickit nostalgic. It was the place my parents took us to every year when I was a kid, and on Thanksgiving morning, my dad and i always went there for 2 gallons of their apple cider.